The legislation and the process are imperfect, they say, but the measure safeguards the economy. WASHINGTON — Maine Reps. Mike Michaud and Chellie Pingree voted in support of a fiscal cliff bill late Tuesday that avoids income tax hikes for the middle class and prevents a sharp increase in milk prices but sets the stage for difficult congressional battles over spending. 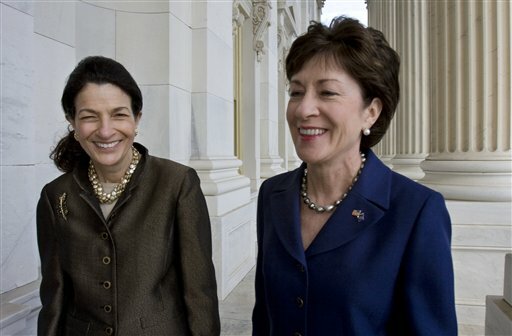 Pingree and Michaud — both Democrats — voted for the bill roughly 21 hours after Maine’s two Republican senators, Olympia Snowe and Susan Collins, joined the overwhelming majority of their Senate colleagues in backing the legislation. The numerous compromises in the bill caused angst on both sides of the aisle. “I felt like that, for a lot of us, it was certainly not a perfect bill and not a perfect negotiation but it would have been much worse to let this drag on and to go over the cliff,” Pingree said moments after the roughly 11 p.m. vote. Michaud said the bill provides tax predictability to Maine families while extending important tax credits for families and businesses. Michaud also noted that the bill prevents a 27 percent cut in Medicare reimbursement rates for doctors, which many feared could cause some physicians to turn away patients or close their offices. Pingree said that, in addition to the tax provisions, she was pleased that the bill extends unemployment benefits for those struggling to find work and prevents a law change that would have nearly doubled the price of milk. “This is about making sure the country doesn’t go backward in this economic recovery,” said Pingree, who is married to S. Donald Sussman, majority share owner of MaineToday Media, publisher of the Portland Press Herald. The bill now headed to President Obama’s desk maintains current income tax rates for most families. Individuals earning $400,000 or more and households earning in excess of $450,000 will see their income tax rates rise from 35 percent to 39.6 percent. The bill also shields nearly 30 million middle-income families from the alternative minimum tax, or AMT; extends tax credits for families with children; continues unemployment benefits for more than 6,000 Mainers and 2 million nationwide who have been jobless for six months or longer; and renews for one more year tax credits on wind energy companies. Most workers will still see their paychecks shrink, however, because Congress opted not to extend a temporary 2 percent payroll tax cut that helps fund Social Security. And Congress will have to deal with how to administer across-the-board spending cuts that have been suspended for two months. The Senate had passed the bill by a vote of 89-8 at 2 am. Tuesday, following last-minute negotiations between Republicans and Vice President Joe Biden. “It’s not the bill that I would have written but, on balance, I think that it will help protect our middle-income families and our small businesses, in many cases, and prevent us from inflicting a severe shock on our economy,” Collins said while leaving the Capitol complex early Tuesday morning. Collins said she was disappointed that the compromise delayed decisions on the spending cuts — also known as sequestration — that have created uncertainty in Maine businesses, particularly those in the defense industry. But Collins said she believed it was important to prevent an average tax increase of more than $2,000 on Maine families and was pleased with language in the bill to avoid a spike in milk prices. Snowe, who is retiring this week after 34 years in Congress, said “it was critical to reach this consensus” on avoiding broader tax hikes that could have undermined the economy and public confidence. For Snowe, the vote might have been the final one of her career. Snowe said the fact that the votes came so late — after the nation had already gone off the fiscal cliff — underscored the frustrations that prompted her to retire.